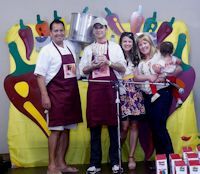 Attention Chili, Salsa and Beer Challengers It’s Time To Enter The Great Petaluma Chili Cook-Off! MARK YOUR CALENDARS – THIS EVENT IS ON SATURDAY, MAY 9, 2015 FROM 1-5PM (rain or shine) AND YOU DON’T WANT TO MISS IT. This may be your last chance to enter this great annual event. Sign up now because spots are ‘first come – first served’ and filling fast. Click here for Chili and Salsa Great Entry Form. These forms are due by March 15th or until spaces fill. Click here for the Beer Entry Form. These forms are due by March 31 or until spaces fill. Are you a vendor or business that wants a lot of exposure. They have beer, soda’s and waters all squared away, but if you have art, service, food, or non-profit that is a good fit for this venue this is a great event to get exposure while supporting the Cinnabar Theater Children’s Program. Click here for the Vendor Entry Form. Any questions send your emails to Laura Sunday at [email protected] A lot of great information can be found on their website GreatChiliCookoff.com. Here is a video of last years event. It was such a great time.